Ashok Karania has completed a doctoral thesis on Indian Film Industry from University of Mumbai. 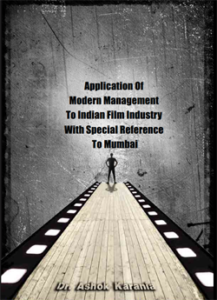 The title of the Thesis was: ‘Application of Modern Management to Indian Film Industry with Special Reference to Mumbai’. The research is one of the first business research on the Indian Film Industry and it coincides with the completion of 100 years of Indian Cinema. The thesis explores the changing paradigms in the Indian Film Industry to understand the growth of the industry. It suggests that the application of modern management practices acts as a catalyst for the overall evolution of the industry. The corporatization and the professional management have resulted in economies of scale, integration across the value chain, diversification of risks and improved profitability for the industry. Based on interactions with film industry professionals and producers of Mumbai, the thesis emphasizes the importance of modern management in strategy, marketing, finance, production, distribution and exhibition for revolutionary growth and overall effectiveness. The graphical version of the thesis report was released by Shri R P Chandaria on Oct 1, 2013. 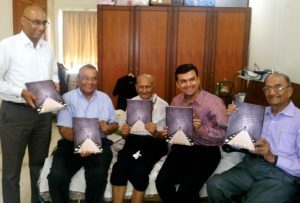 Shri R P Chandaria has been a great inspiration and this was incidentally his last release. Shri Uttam Gajjar, Shri Vimal Chandaria and Shri Rashmi Chandaria were also present at the release of the thesis report. The synopsis of the thesis report is available for download. Download It Now ! Feedback and suggestions heartily welcomed !